You’ve waited for this day for a long time!! Now, it’s going to be a reality!! Don’t settle for a subpar wedding DJ. 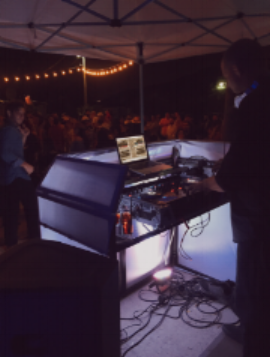 Through organization, proper planning and client interaction, DJ Jeffree will keep your reception rocking all night long! Your wedding, your music!!! Let him know what songs you like. He’s not here to judge — if you want that obscure Simon & Garfunkel song to play 30 minutes in, he can do it. DJ Jeffree does more than just play music, he injects life into the party. Everyone wants perfect moments at their wedding. DJ Jeffree helps deliver those by handeling ALL the music, microphones and sound system needs for your ceremony and reception (and entire wedding). This includes a separate, dedicated ceremony sound system with microphones for the officiant and couple for vows. DJ Jeffree can also take care of customizable prelude and recessional music, walk down the aisle song(s), and/or any other special moments throughout the event. All cues will be on-time with expert sound execution. Customizable Up-lighting to match wedding colors. December Holiday Party aboard the world famous Queen Mary for Volvo Motors. Smaller, quaint and rustic wedding in the quiet mountain town of Idyllwild, CA. AMC/Hulu show FEAR THE WALKING DEAD Season 3 wrap party. All Latin/ Reggaeton music selections. A truly amazing opportunity! Indoor/ Outdoor receptions and ceremonies. Familiarity with venues across Palm Springs and the Coachella Valley allow for streamlined wedding/event DJ service.